We will be happy to welcome scientists at the congress of IV. 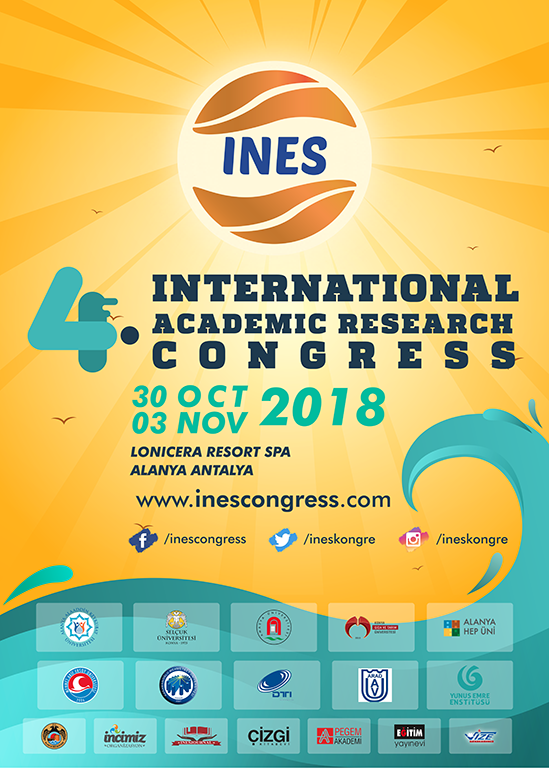 INES Education and Social Science Congress (INES - 2018) which we will organize between October 30 and November 3, 2018. The congress will be held in Alanya with the cooperation of Alanya Alaaddin Keykubat University, Selçuk University, Konya Food and Agriculture University, Amasya University, Alanya HEP University and DTI University (Slovakia) and Alanya Municipality. The aim of the Congress is to bring scientific and social interaction, to develop cooperation among scientists, to share scientific work, practice and experience and to contribute to the formation of new perspectives and work areas by bringing scientists who work in the fields of Educational Sciences, Social and Human Sciences, Sport Sciences and Fine Arts, Mathematics and Science, Agriculture and Natural Sciences and Engineering together. The abstracts presented in the congress will be published as e-books, and the abstacts presented in the congress will be published in the full The abstracts of the declarations presented at the Congress will be published as e-books and full texts of the declarations will be published either in congress declaration book or in the edited e-book section, if requested. In addition, an international group exhibition will be organized within the scope of the congress. We will be pleased to see you, precious scientists, at INES International Congress of Education and Social Sciences between October 30 and November 3, 2018 and we wish you the best of success and luck in your studies.